Is This The ”Green Lady” Of Crathes Castle In Aberdeenshire? THIS is the creepy image of a mysterious “ghostly figure” taken by a holidaymaker at a haunted castle. 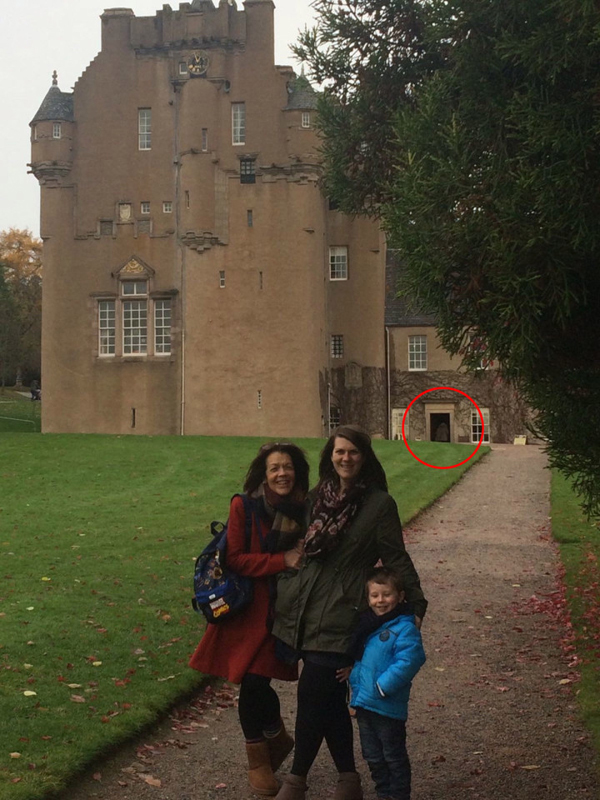 Bill Andrew, 78, from Bridge of Alford, Aberdeenshire, was taking a picture of his family in front of Crathes Castle when they noticed what look like a ghostly apparition in one of its doorways. He went with his daughter Coleen Marsh, 60, his granddaughter Jessica Hockley, who is in her 30s, and great-grandson Findley Hockley, three, who all live in Kent. It was only after the picture was taken that Coleen spotted the strange figure in a doorway in the background. His daughter Coleen contacted staff to see if there was an explanation for the ghostly sighting as the door was closed. The property manager James Henderson said: “There have been a number of mysterious sightings in and around the castle of late, in particular around Halloween, and the castle guides have reported that things have felt strange. “They have reported a chill down the back in an otherwise warm room, odd noises in an otherwise empty building.